“I came up with the idea for this painting while working on the book, Lehi’s Dream. The everyman is enjoying the white fruit of the Tree of Life, but the tree is coming from his hump—from his trials and adversity. 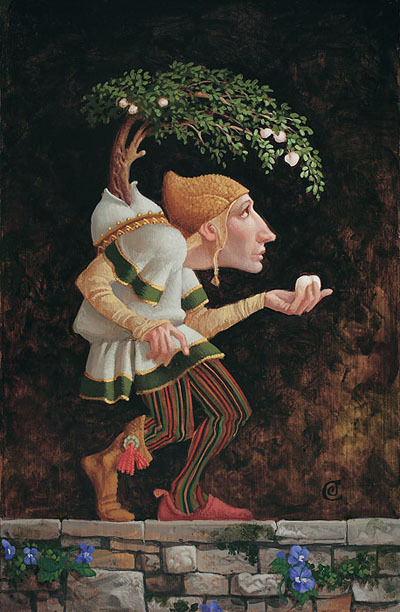 He’s walking on the straight and narrow path, which happens to be on top of a wall in this painting, but it’s through the adversity he has endured that he is at last able to enjoy the fruit. “This painting is a continuation as well as a return to the themes addressed "Sometimes the Spirit Touches Us through Our Weaknesses" and "After Clouds, Sun." I think because I was immersed in the story and symbols of Lehi’s dream, this image popped into my head as another way to express the idea that our trials are given to us to help us grow and become more perfect."